##TheStrategyLab is primarily designed for you to use the chat room as a real-time trade journal so that you can have a real time stamp archive of your trades or your market commentaries each trading day as you traverse from one trade to the next trade to go with your broker statements because broker statements do not explain the critical details of how you're trading from one trade to the next trade...the free chat room will explain those critical details that will later provide you with critical feedback about your trading. Note: Do not post your broker statements in the free chat room. Instead, ask us to setup a private thread for you so that you can post your broker statements (simulator or real money), backtests or statistics from a professional trade journal software. Our free chat room in combo with your broker statements and statistical analysis of your trading is a powerful tool to self-help your own trading. Image above in this message post represents what many users in the private chat room were able to see via screen sharing...I took a quick screenshot while in screen sharing with other members for marketing purposes, for my own private trade journal documentation (other two monitors not shown for security & privacy reasons) and for verification that I traded on that specific trading day I posted real-time trades in the chat room for those that were not in the chat room or not allowed in the screen sharing for whatever reason with others that were allowed. I document my trading with images like this every trading day (several different times per day) in combo with my daily brokerage statements so that I know what my monitors looked like on a specific trading day because I use different templates in my chart configurations and my broker PnL statement screens depending upon market conditions involving changes in volatility. We have the above rules because its what we do ourselves and expect users of TheStrategyLab to do the same when they use our resources to self-help their own trading on the road to be an independent trader...part-time or full-time. Most important reason for showing images of timestamp trade fills in broker trade execution platform or timestamp trades in broker statement of one particular trading day is to show traders they can document their trades or analysis via their charts and trading platform for their own personal trade journals stored in their private trade journal. The documentation gives them valuable feedback about what they were looking at on their nmonitors for any particular trading day...valuable information then just looking at profit/loss numbers in broker statements alone. Regardless, we highly recommend you use the free chat room in combo with a professional trade journal software like tradebench.com, edgewonk.com, tradervue.com, tradingdiarypro.com, stocktickr.com, journalsqrd.com, tradingdiary.pro, mxprofit.com or trademetria.com because these professional trade journal software will do the quantitative statistical analysis for you involving your trade performance so that you can determine on your own the strengths & weakness about your trading. Later, if you want to, you can then post your statistical analysis in your private thread for your eyes only in reviewing your trade results as you traverse from one trading day to the next trading day. As stated above and in the access instructions for the free chat room...this is not a signal calling trade room nor a live trading room alert service with a head trader telling its members what to trade, when to buy and when to sell in the market. Also, the chat room is not designed to be educational. The trade education, if you need it...occurs at the forum and not in the chat room. Simply, members using the chat room are not there to teach you how to trade and you will not see me discussing the reasons (strategies) behind my trades within ##TheStrategyLab free chat room because those reasons (strategies) are only discussed with fee-base clients in a different chat room. Yet, if you want ##TheStrategyLab chat room to be educational or more active in discussing whatever it is that you're trading, we highly recommend that you ask trading related questions about your own trading instead of lurking (not saying anything) because your primary purpose is to improve your trading if you're a struggling trader. Also, don't join ##TheStrategyLab and then be silent. To be silent while using ##TheStrategyLab chat room...is an early indication you're trying to use our free chat room as a signal calling trade alerts room. Simply, you're logging in for the purpose to mimic/copy trades by our members instead of posting your own realtime trades. Further, it will imply that you're really not interested in any trading conversations by our members that may be helpful to your trading. Thus, you'll be wasting a collaboration opportunity for improving your trading and doing such will make ##TheStrategyLab chat room useless to you. Therefore, post your real-time trades or real-time market analysis to help document your trading day...we'll moderate the free chat room to prevent others from bothering you when you use the free chat room the way it was designed to be used. Yet, if you believe the free chat room is a distraction to your trading...do not log in. Yet, if you log in but you do not have the time to post your trades...post images of trade fills in your broker trade execution platform or broker statements in your private thread at the forum when your trading day completes. Note: Fee-base clients that log into ##TheStrategyLab chat room...they are not allowed to discuss any concepts from our fee-base strategies within ##TheStrategyLab chat room because they already have their own private chat room that's designated for real-time strategy discussions. 1) These are real trades or simulator trades (depending upon the trader posting the trades) and not signal calls. Also, the real time trades you see posted in the chat room by different users are only posted within 5 seconds after receiving their trade confirmation from the broker trade execution platform. Simply, there are no guru traders in the chat room telling you what to trade, when to buy or when to sell. We allow traders to use our free chat room to document & journal their trading so that they will have useful info to go along with their broker statements and quantitative statistical analysis...info they can not get from numbers (data) only. 2) Our chat room requires participation to maintain its usefulness. Therefore, you will never see the real-time trades fast enough to mimic the trades from amongst commentaries by other members. Simply, you can't get similar like trade fills on the entries, exits and position size. 3) Some members do not want others trying to mimic their trades because they know that most traders that do mimic without permission...usually aren't respectful and give nothing back in return to the chat room usefulness. 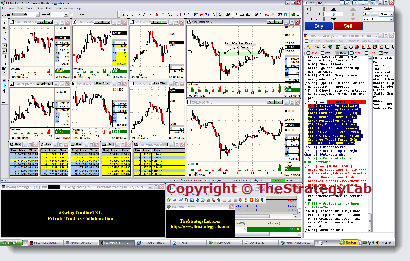 4) The chat room is designed to be your own personal trade journal of your market thoughts, questions and/or trades. Yet, if you join our chat room in an attempt to use it as a signal calling trade room or live trading room alert service...you'll be greatly disappointed and the chat room will be useless to you due to the fact that we do not offer a signal calling trade alert service. We are just moderators to keep the peace between members in the free chat room just in case trouble makers and/or trolls show up to cause problems. That's why we have a bad reputation with problematic traders and trolls along with us often being threaten with "bad reviews" because we do not offer services that "lazy traders" typically are looking for. We require you to document your real-time trades or document your real-time market analysis...anytime you use the free chat room. Do not attempt to mimic the trades of any trader in ##TheStrategyLab chat room. If we suspect you've joined ##TheStrategyLab to try to use it as a signal calling trade room in an effort to piggy back (mimic or copy) someone's trades, you will be banned...no exceptions and no warnings. Once again, ##TheStrategyLab is free and designed to be only a trade journal for documentation purposes only so that members can have a real time stamp archive of trades and market commentaries of each trading day so that they can better understand their broker statements from one trade to the next trade when they review their performance numbers on any given trading day. Simply, if you're attempting to use ##TheStrategyLab as a signal call trade room...you're using ##TheStrategyLab for the wrong reasons and the chat room is not suitable for you. In addition, we welcome all traders with their own methods of price action or indicators via different trading styles that's trying to merge it with concepts from WRB Analysis to help keep the chat room diversified...posting trades, price action analysis or market commentaries. Yet, if you're looking for education specifically involving trade methods of TheStrategyLab that we call WRB Analysis...you must first download and learn our WRB Analysis free study guide @ http://www.thestrategylab.com/tsl/forum/viewtopic.php?f=119&t=718 prior to asking any questions about someone's trades, price action analysis or market commentaries. Last of all, to prevent the usual mix-up about our different chat rooms, most of our fee-base clients do not use chat rooms just like most retail traders do not use chat rooms. Yet, the few clients that do use chat rooms, our fee-base clients are discussing market analysis or trade signals via concepts from our strategies in the private chat rooms called ##VolatilityTradingTSL or ##WRB_Analysis and they're not allowed to do such in ##TheStrategyLab.